When we decided we were moving to Providence, there were several things that I was excited about. One was being close to Maine. It is one of my favorite places to visit, and from Providence, we can be there in just over 2 hours. Another was knowing that family and friends would be visiting, and that our time together would be exciting due to exploring new areas and showing off some of our favorite places. My mom was visiting for Mason’s birthday a few weekends ago. One of Mason’s request for her birthday was to eat lunch at this bread bakery in Ogunquit, Maine that we had eaten at on vacation there two summers ago. 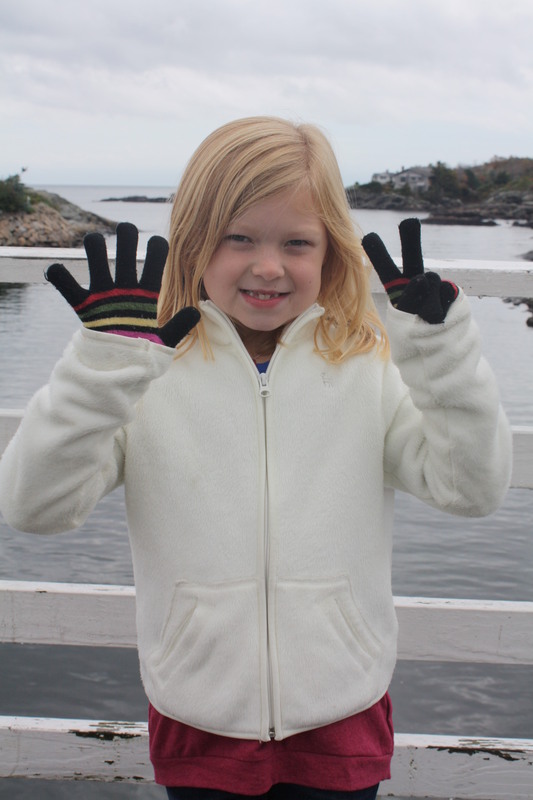 Such a simple request, and it meant that we could finally get to Maine! Jeremy was going to be up there already for a guys’ weekend, so my mom and I decided to make a weekend out of it too. We drove up to Freeport Saturday afternoon, enjoyed some LL Bean shopping and a great dinner at a local brewery, then spent the night at a hotel (always a hit with the kids!) Sunday morning, after a quick swim in the indoor pool, we set off to pick up Jeremy and start Mason’s birthday celebration. 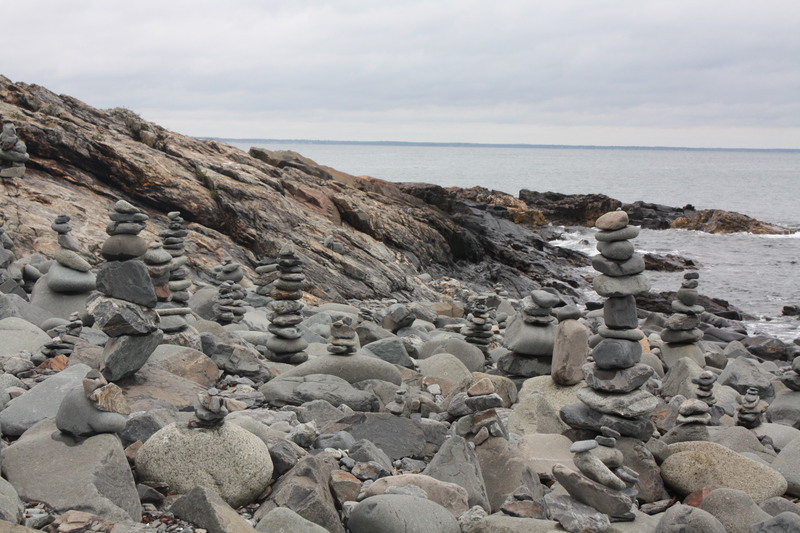 Even though it was a rainy day, we still enjoyed a nice walk along Marginal Way from Perkins Cove to Ogunquit. The clouds and damp air actually made the fall foliage stand out more, and it was wonderful to have a true Maine day in October. 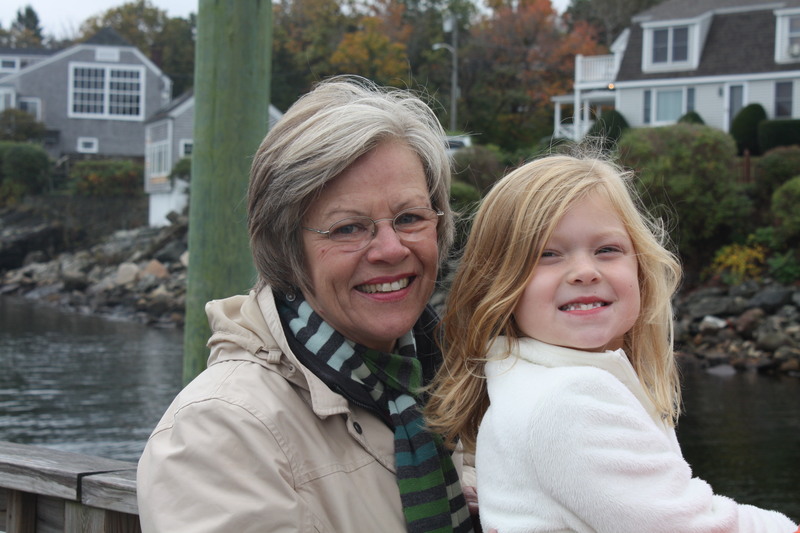 We loved sharing Ogunquit with Meema, and I have a feeling she will want to go back. She saw the beauty just like we had. The perfect example of why I love living in New England! We had a great lunch at the bakery Mason requested before heading back to Providence for tacos (another birthday request), cookie cake, and presents. 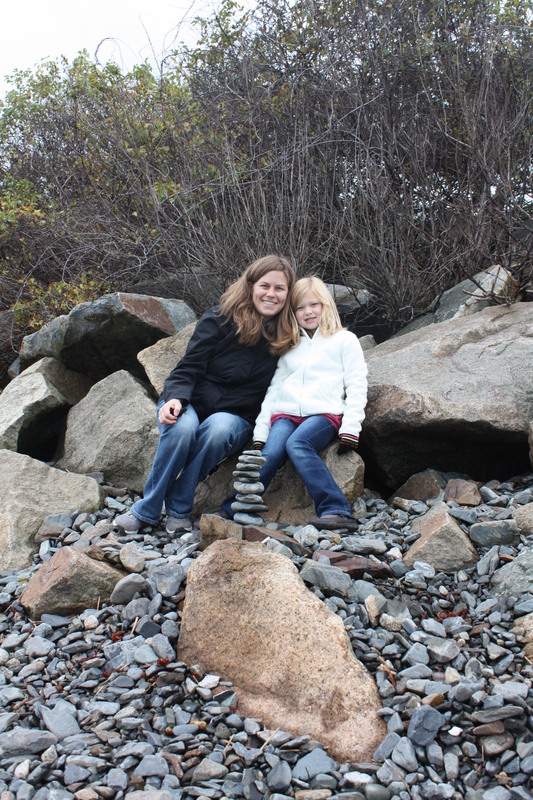 It was a fun-filled weekend, but our walk in Maine with my mom and newly 7-year-old daughter was the highlight for me. Mason loved having Meema there for her birthday! 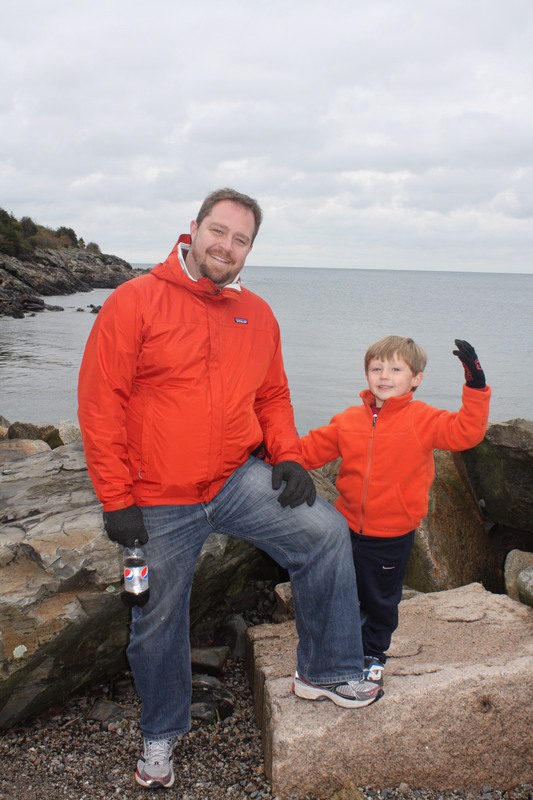 Cooper loved his new orange jacket from LL Bean so he could match Daddy. … and, of course, had to build our own! 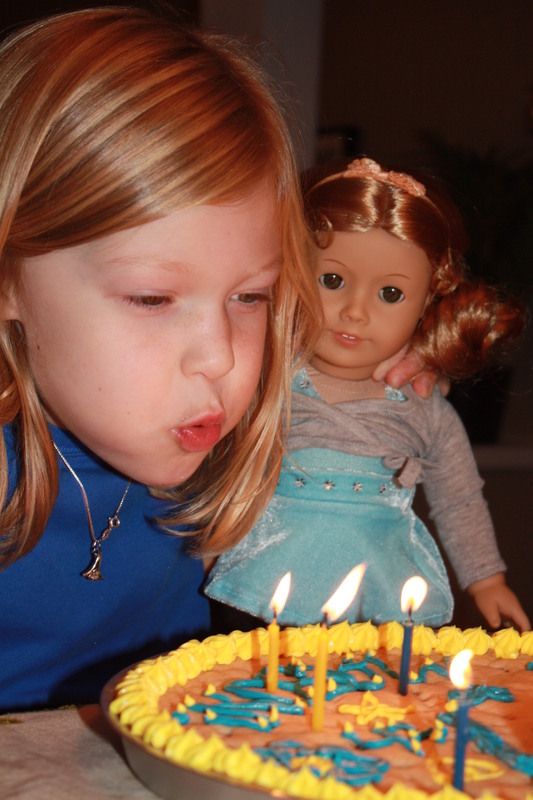 With her new American Girl doll by her side, Mason officially celebrated 7 years. It feels like I haven’t posted in a long time. In reality, it was just last week. So does that mean time is going slower than I think or faster? I don’t even know these days. I’m feeling a little crazed. It’s all good, though. Considering my less than frequent posts, I decided it was high time I let you all know what has been happening around here. The biggest change is that I actually have a job! Yes, I real job. Well, it’s not quite a 9-5 job, and I’m not on anyone’s payroll, but I promise it’s a job. And it’s exactly almost exactly what I wanted. Let’s back up a bit. We moved here to Rhode Island at the beginning of July. Jeremy and I had decided that I would not look for work until the kids had started school so that I could be with them as we transitioned into this new world. Of course, I got antsy, interviewed for a job in late-July and actually got offered the position. They couldn’t really wait for me over the summer, and I wasn’t ready to “settle” for the first thing that came my way, so I didn’t take it. As the days went by and the start of school was nearing, I dove head first into my search again. Nothing came of it. Literally nothing. I was distressed, impatient, lost all confidence, and totally annoyed. I seemed to be priced too high for anything that actually sounded interesting but couldn’t quite find the jobs that were at my level either. I was stuck. It was time to use my connections. Through a co-worker of Jeremy’s, I was introduced to a local realtor. I was interested in talking to him about how real estate worked here in Rhode Island (as in, did realtors use assistants here?) and just make a connection in case he had clients who were hiring or something. I did not expect him to tell me that he was hiring. Bonus! I met with him, then I met with the two other women on his new “team.” And then they offered me the job as Client Care Coordinator. I am responsible for all the behind the scenes stuff – tracking documents, taking pictures, scheduling showings, etc. It is the essence of organization, and it is right up my alley. Heck, I even have experience in the same role. Unfortunately the pay is not great, but it has potential. Jeremy and I talked a lot about it and decided that it was worth the financial hit for me to be happy and excited about my job, work with people I really enjoy, and to have the flexibility to work from home when needed or be there for the kids. I’ve been at it for a few weeks, and I am already so happy with the decision. I believe that everything happens for a reason, and I feel blessed this opportunity came my way. The new job is one of the reasons why I have been MIA lately. The other is that I am in classes three days a week to get my Real Estate Salesperson license… again! I was licensed in MD/DC/VA back in 2008 when I worked for another realtor, but I let it lapse when I started working full time at another job. Thankfully that means a lot of the class is review for me. But it is still 9 hours a week in class and several other hours of reading and studying. I’m trying to stay on top of things since I have scheduled my exam for November 20th. It sounded like the best thing for my schedule – start a new job, take classes, prepare for and take the exam all within 7 weeks… Why not?! Yes, it’s been hard. Yes, it’s been busy. But it really made the most sense for me to get my license done and out of the way so I could be the most help to the team of realtors I work with. I don’t plan to start selling or helping buyers, but with my license I can legally do a lot more as the Client Care Coordinator, and that was important to me. So there you have it. I guess I’ve answered my own question, where does the time go? It flies by quickly when you’re busy and having fun! P.S. There are several other things that have kept me away from blogging, and I promise to post about them soon… with pictures! Lately, I have been reading like crazy. It’s actually very odd for me, even though I was an English major. I guess I just never felt I had the time to pick up a book and read, nor did I want to. (I did enough of that in college!) I would have rather flipped through some pages of my Real Simple if I had a few free minutes. But ever since my wonderful husband gifted me a Kindle for Mother’s Day, I’ve been on a roll. I’m now on my 12th book since then, and I wanted to share what I’ve been reading in case anyone out there is looking for recommendations. I will preface the list by saying that I read a lot of fluff. It’s like my love of chick flicks and sitcoms. When I’m reading, I want to be entertained. I don’t want to be scared. I don’t want to put a lot of thought into it. I don’t want to solve a mystery. I just want to read and be taken away into another person’s life, whether it is similar to my own or completely different. So if you like is Jodi Picoult or Dan Brown, we’re probably not on the same page. But you still may find something that interests you below. After getting a sense my taste in books from above, if you have any recommendations for books I can add to my “must read” list, please let me know! Like I said, I’m a reading fool these days. Seven is supposed to be a lucky number, right? And according to my Baby Center updates, this is the year of the “lovable sevens” and “one of the most rewarding phases of parenthood.” That’s a lot of pressure on seven. After the “terrible two’s” and “trying three’s” and whatever they call four, five and six, I am ready for this year. I’m eager to see how much more rewarding this year can be, though. I am constantly in awe already, and my heart swells with pride a lot. I already have been rewarded in parenthood because I have a daughter who loves to learn, loves to teach, loves to dance, loves to walk, loves to be silly, loves to cuddle… and best of all, loves me no matter what. It can’t get better than that, can it? So bring it on, seven! Let’s see what you’ve got. It has been no secret that there have been some rough transitions up here in L’il Rhody. Most nights after school there are meltdowns (either me or the kids.) Most mornings there is some fight that starts the day off wrong. And the weekends… well, don’t even get me started… again! The key to all these meltdowns, though, is that they are mostly at home or at least only directed towards Jeremy and I. We feel blessed in that way. Our kids seem to do great at school. It’s just when they come home that they let it all out. This was confirmed this morning when I dropped off Cooper. His teacher pulled me aside and told me how amazing he is doing at school. She told me that he has transitioned so well, and that all his teachers are surprised with how great he is doing despite all his life changes. Apparently he is opening up a lot more and even approaching the teachers on his own to start talking and tell them things. That’s a huge step for him. 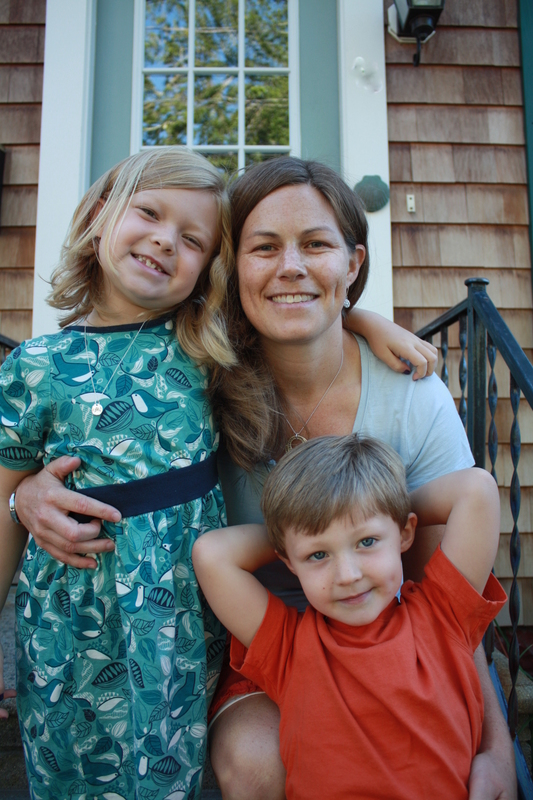 Back in Maryland, he was a talkative kid, even to grownups he didn’t see often. We would be leaving his preschool, and he would just start talking to another parent like it was no big deal. It has been different here. He is talkative at home, but he’s much quieter otherwise, which is why hearing his teacher tell me he is talking to her a lot just made my heart swell. Maybe we’re finally getting over the hump. Mason is also excelling at school. I don’t mean to be a braggy parent, but I’m just so proud of how she is doing. And if it can give anyone else hope that there is a light at the end of a tunnel after a major move with small children, then I want to shout it off the rooftops. At Mason’s Back To School Night, her teacher told me that you would never know Mason didn’t go to kindergarten with the rest of the kids. Apparently she is fitting right in and making herself comfortable at her new school. Even her school’s secretary mentioned to me that she is happy to see Mason settle in so nicely. Seriously, my heart is full when I hear these comments about my kids. I love them so much, and I was stressed and worried about how this move would affect them. But they are strong. They are brave. They are amazing. Ok, enough bragging. Just know my heart is full on this beautiful Friday afternoon.